Nicergoline Benefits | Does Nicergoline Increase Brain Power? 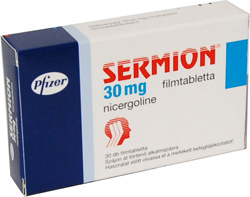 Nicergoline is a prescription drug that has been used in more than fifty countries as a treatment for senile dementia as well as other vascular-related disorders. Aside from that, the drug has been found to be very effective in improving one's mental agility, especially among elderly people. According to many reports, this prescription drug does helps enhance perception and other mental qualities. The prescription drug Nicergoline is a derivative of ergot and is commonly known under its trade name Sermion. It has been used over the years as a treatment for strokes, migraines, cerebral arteriosclerosis as well as cerebral ischemia. Aside from that, the drug has also been found to help in reducing vascular resistance and in increasing the flow of blood in the arteries of the brain. Because of this, glucose and oxygen are better utilized by brain cells, which results in more efficient brain operation. The use of Nicergoline has proven to offer many benefits to the user. First off, it may be used to treat several vascular disorders such as arterial blockages in the limbs, retinopathy and cerebral thrombosis and atherosclerosis, among others. As a nootropic, this prescription drug is also said to improve certain brain functions, including the enhancement of one's mental agility (including perception and clarity). Nicergoline is also said to inhibit platelet aggregation, which prevents the formation of a thrombus or clot. Nicergoline is generally safe and does not result in serious side effects. Its reported mild side effects include hypotension, dizziness, hot flashes, nausea and mild gastric upsets. Users may also possibly experience insomnia, sleepiness and vertigo. When taken in higher dosages, it has been found to cause diarrhea, an increase in appetite, perspiration as well as agitation. So far, there has only been one reported case of an acute interstitial nephritis resulting from Nicergoline use. How Does Nicergoline (aka Sermion) Help Brain Function? Experts have found out that Nicergoline is a nootropic and can positively affect certain functions of the brain by increasing the arterial blood flow in the brain. As a result, there is a marked improvement of the utilization of oxygen in the brain, which helps enhance mental agility, clarity and perception. It has also been found to increase the nerve growth factor, which is important in the growth, maintenance and survival in certain neurons of the aged brain. For more information on which brain power supplements contain Nicergoline, please check our brain supplement reviews!